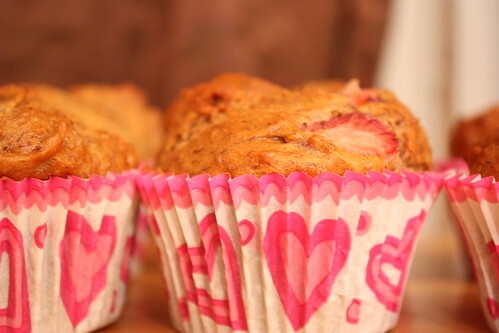 These muffins are wooonderful. 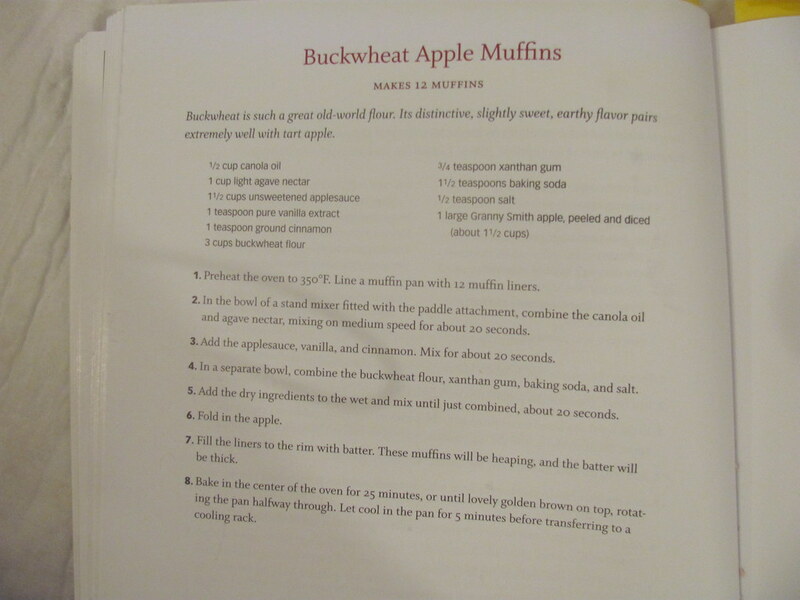 I originally decided to try this recipe because I’d never baked with buckwheat before, and it looked very simple. 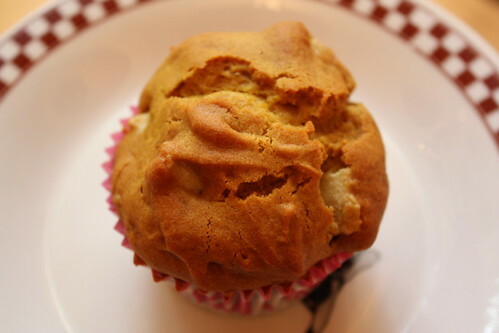 Well, the batter was simple, but peeling a large apple takes forever! 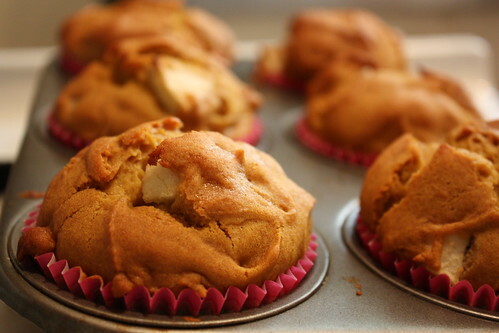 Next time I make these muffins I’m going to try blueberries instead of apples, I think that will work well. 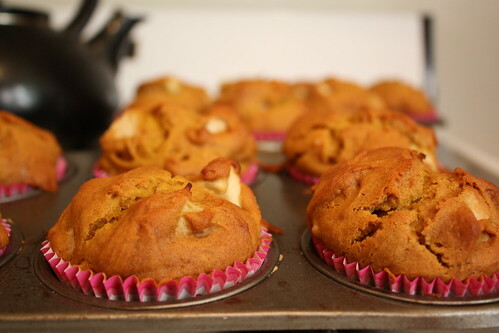 I altered the recipe a little bit – I used 1 tbsp of cinnamon instead of 1 tsp, 2 cups of apples instead of 1.5, and I ended up with enough batter for 13 muffins instead of 12. 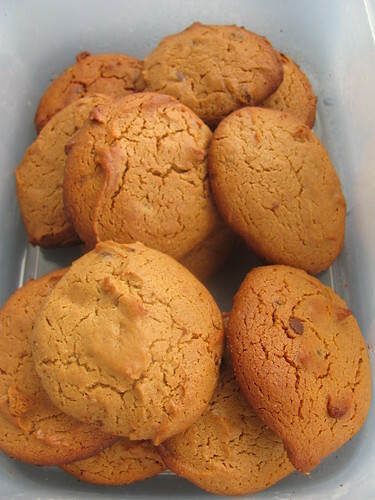 Another change I made was to bake them for a little longer – 29 minutes instead of 25. 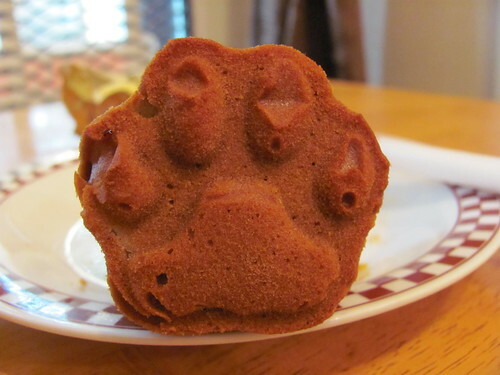 I put the 13th muffin in paw-shaped muffin cup I got for free from The Animal Rescue Site. 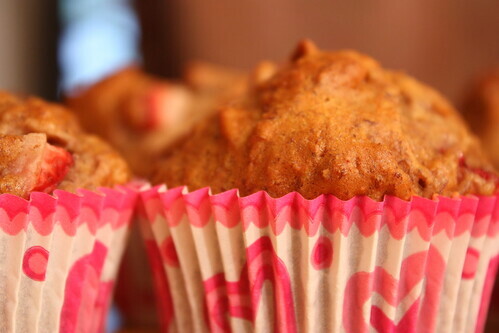 A paw shaped muffin, adorable!! 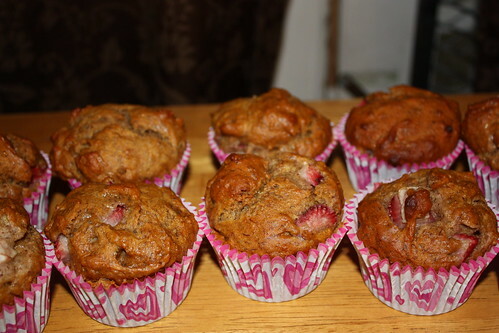 I ate two of these muffins right out of the oven with a little Earth Balance. 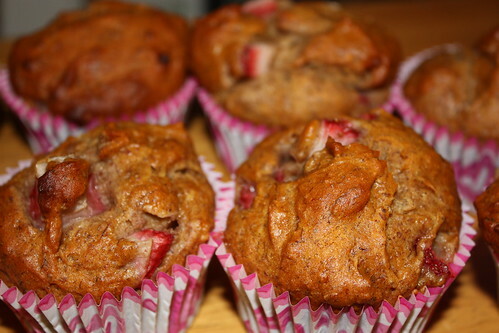 They’re pretty healthy and delicious, a perfect breakfast muffin! 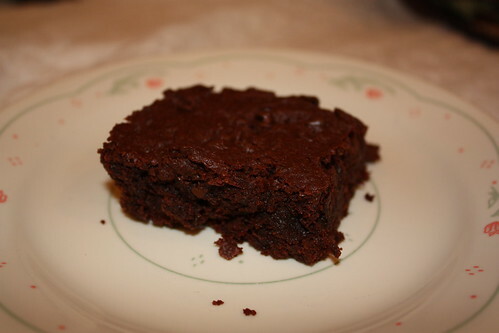 I used this recipe and added two tablespoons of instant coffee. Unfortunately, the coffee flavor wasn’t very strong at all and I wanted them to scream COFFEE in each bite. 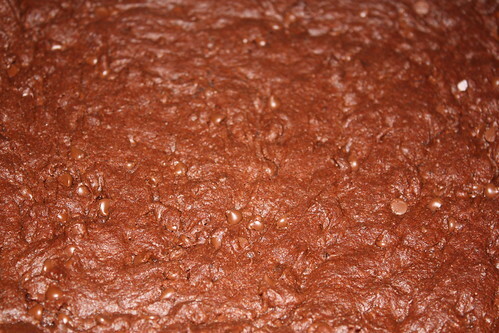 Oh well, I’ll try again later with more added, or maybe some coffee extract. 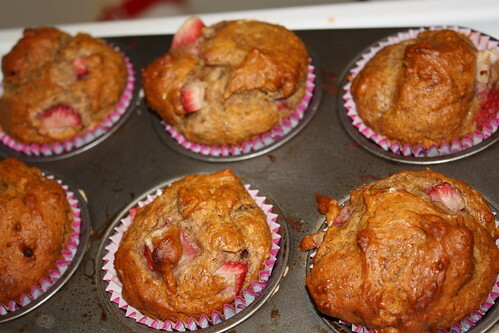 They were still delicious though! Also, an important note. 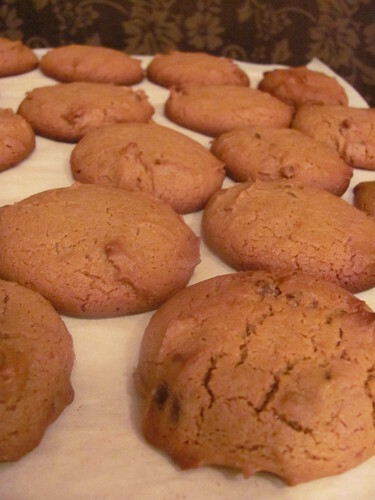 In my last recipe I used a different kind of chocolate chips (I forget what it was) then in the recipe and this time I used the Enjoy Life rice milk chocolate chips that the recipe calls for. I was surprised to find they were actually the cheapest chocolate chips at the store (I got them at a local co-op). 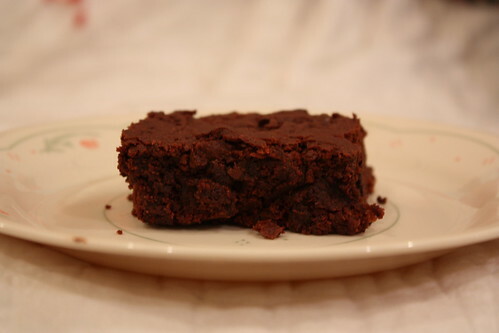 So in addition to being dairy and soy-free, that’s another plus! 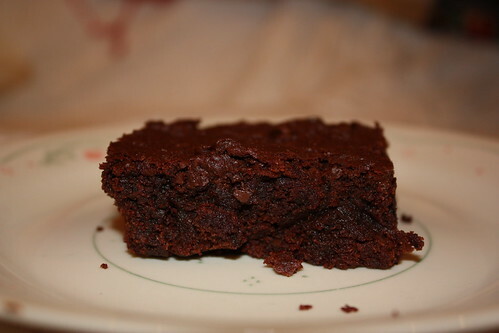 This experiment was HIGHLY successful. 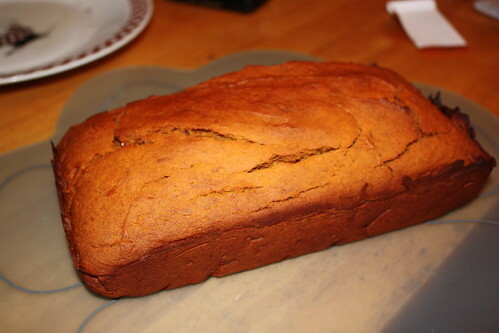 I loaded up mine with spices but you can choose to make them plain, or just lightly salted. 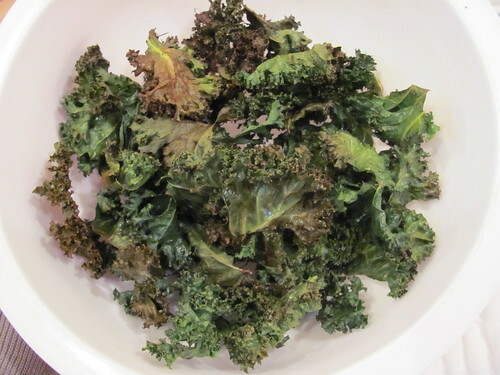 Tear up the kale into small pieces, don’t use any of the thick middle stem. Toss with a little olive oil and apple cider vinegar in a bowl. 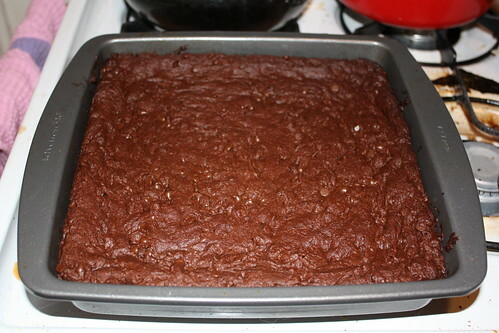 Spread out on a baking sheet and sprinkle with what you want. 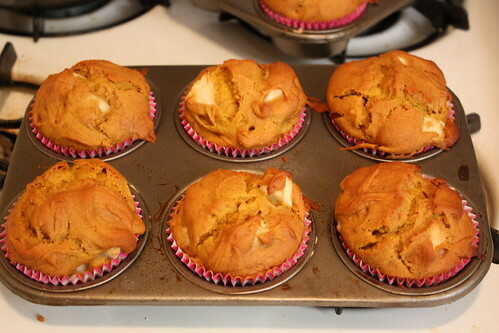 I used these: Salt, pepper, sweet curry powder, cayenne pepper, and seasoned salt. 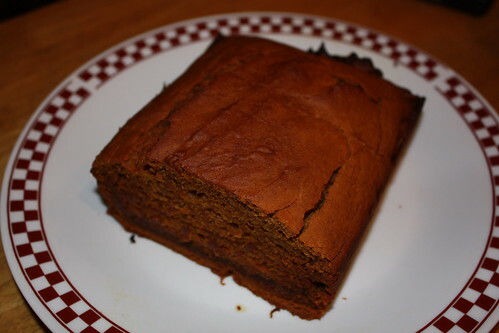 I made this pumpkin bread from the Allergen-Free Baker’s Handbook. 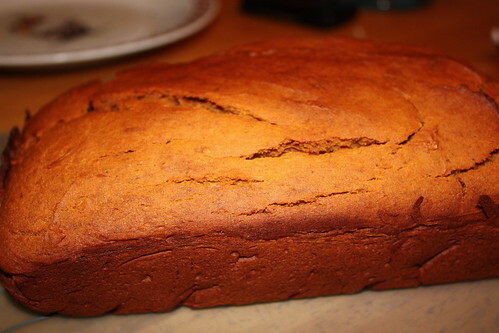 I looove pumpkin bread and banana bread together with apple butter, one of favorite treats. 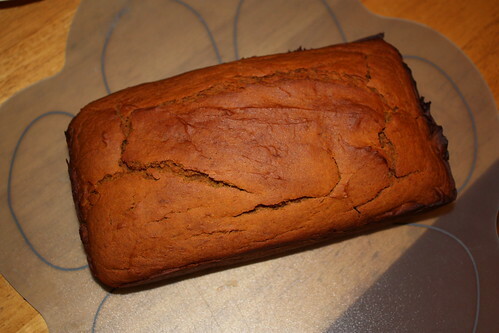 This was also very simple to make. 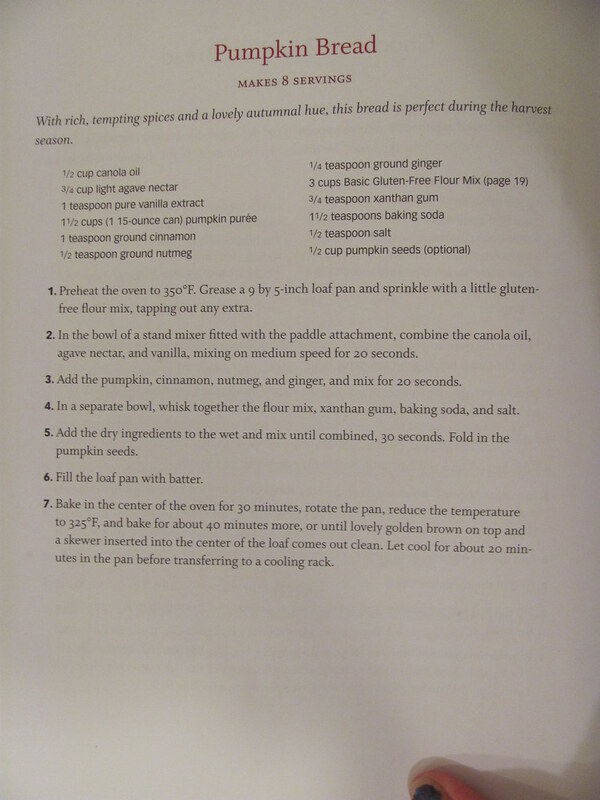 I used a can of pumpkin pie filling and so I skipped the step of adding the spices. 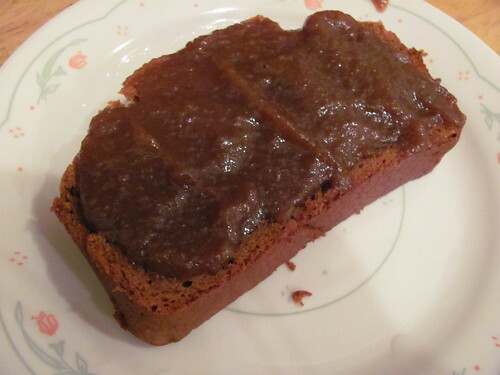 A slice with apple butter! So good. 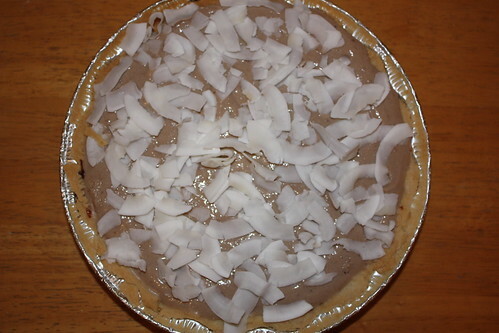 Originally I was planning on making a plain chocolate pudding pie, but as I thought more about it my idea grew and grew until it ended up as this: The Chocolate Island Pie. 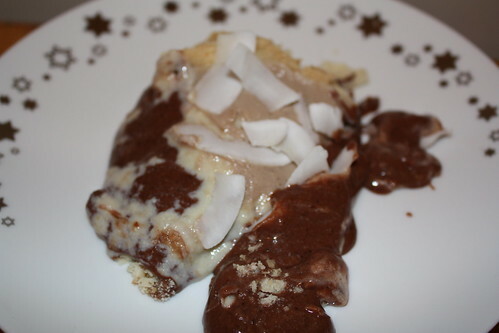 A lovely mix of chocolate, coconut, and bananas! 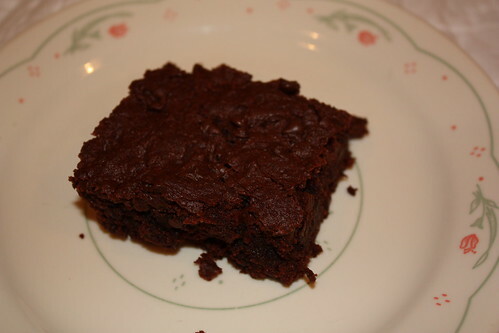 Well, it didn’t quite turn out right – the taste is fantastic, but it’s a big goopy. My husband assured me that it’s ok for a pie not to be perfect triangles when cut, but I still feel like I should fix this so it’s firm enough to retain its shape. 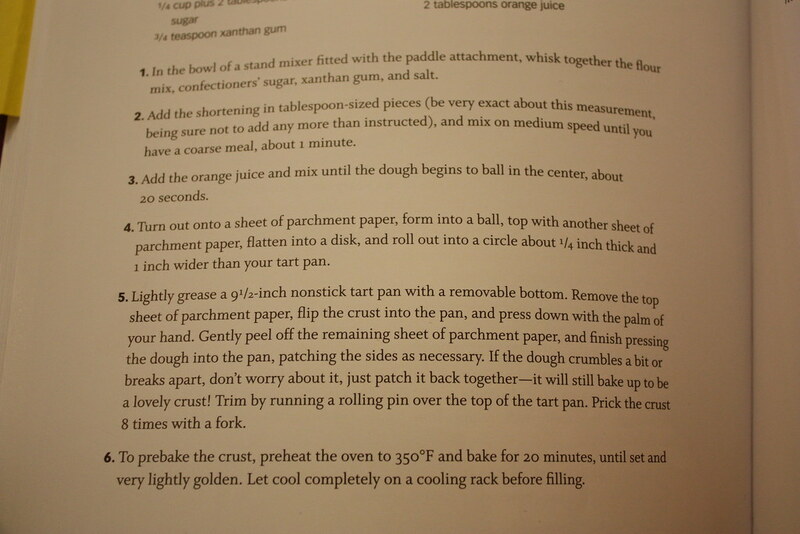 Now it’s more of a custard in a pie crust. 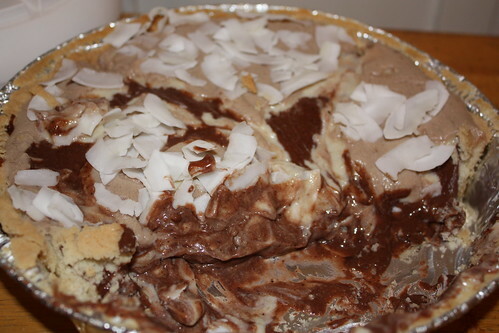 If you don’t mind goopy pies go ahead and try the recipe, I can promise you the taste wont disappoint! 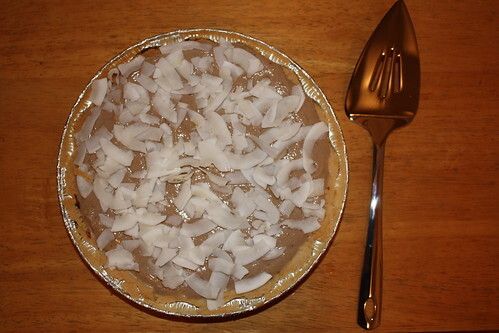 Mix together the pudding mix and coconut milk according to the package direction’s. 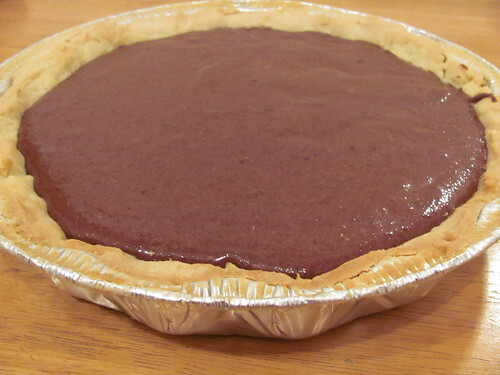 Pour into the pie crust and let chill for a few hours. 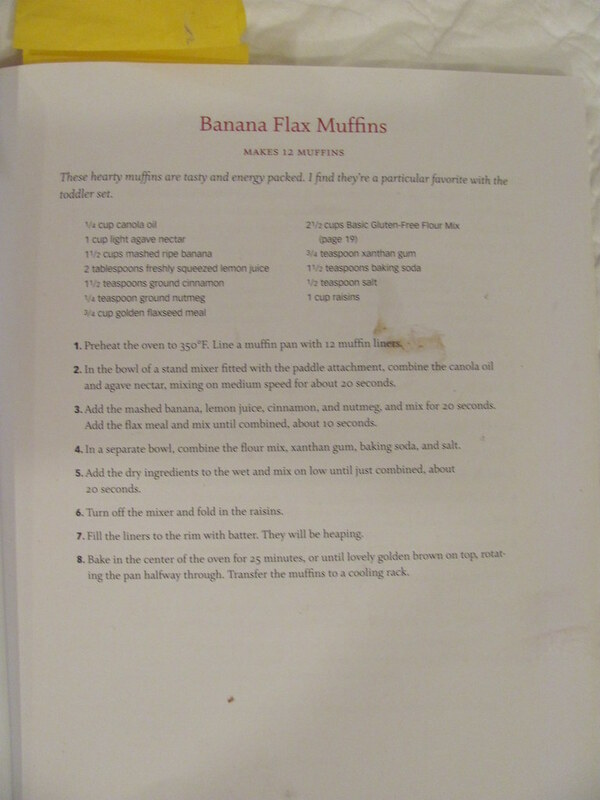 Mix everything together in a blender or food processor. 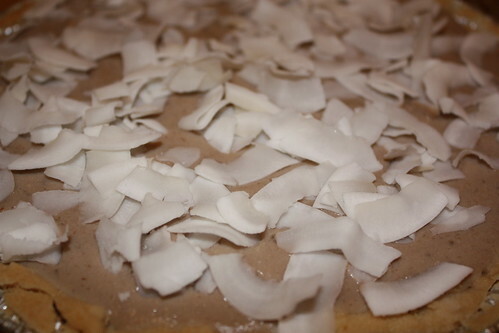 Pour on top of the chilled chocolate, and top with the shredded coconut. Return to the fridge to chill for a few more hours.